Classic Black Hills Gold necklace from Landstrom's Black Hills Gold. This is Black Hills Gold in all its glory, a truly classic design. Available in tri-tone gold (12 karat green and rose gold leaves set against 10 karat yellow gold) for $141.47 or sterling silver (12 karat green and rose gold leaves set against sterling silver) for $60.25. 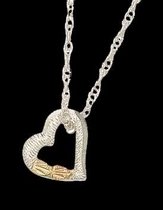 Comes with an 18 inch gold or sterling silver chain and elegant gift box.